If they cant see or hear you it doesn't matter how good you are! A Main Powerhouse in the industry for over 30 years! Welcome to the website of one of Utah's most trusted names in Live Sound, Lighting Design, Event Production, Staging, Rigging, and Rentals! 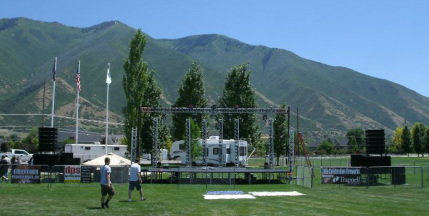 We have been working in Utah for decades and have the experience to make any event you are planning come together smoothly. We offer a wide selection of live productions options, and different equipment packages with millions of dollars in Live Sound, Lighting, Staging and Accessories. We offer the most affordable sound, light and staging in the Intermountain West and pride ourselves in making the events and productions we do fantastic! Not only do we have an exhaustive list of satisfied clients from our many years, we are also always open to accepting new clients. Whether you are planning a large event for 30,000 people or a small gathering of 30, we look forward to assisting you in making everything work together smoothly. We look forward to assisting you! We have helped out at this event for the past couple years. We love bringing out big sound to the local High Schools and rocking their world. It is a lot of fun seeing the look on the kid's faces when the lights go on and the music gets loud! Having a great party can really hinge on having great equipment, and this setup was absolutely incredible! Check out the video and see why we throw the best high school parties in the State of Utah! This is a yearly party that we do for New Years in Orem, UT. Every year the production get bigger and bigger. This year we places curved trussing behind the main stage with columns surrounding the performers. It looked like what the Roman's would party under if they were still in existence. For sound we brought out a smaller section of our much larger line array system, and needless to say, the sound was nearly deafening! The event went very well with over 4,000 people in attendance, and we loved being a part of it! This was an amazing party to say the least. We had over 4,000 people show up to have a great New Years Eve. We had some performers there, Large Trussing in every direction, and a Sound System that made people dance whether they wanted to or not. Light shows are very important to us, and our light up trussing is very bright, programmable and moves the music. You feel like you are at a giant concert at the events that we do. This was one of the first years of Newphoria, and the show didn't disappoint. David Archuleta made a special guest appearance and performance. He sang his #1 hit song "Crush" and kept the crowd entertained with a few covers. We cannot express how great it was to work with him and to have one of our biggest and best events up to that point in time.